This week at Computex, Corsair took the wraps off of a particularly interesting mechanical keyboard. Dubbed the K68, Corsair is dipping their toe into a feature that we almost never see on true mechanical keyboards: water/spill resistance. As a result, the K68 is joining a rather exclusive club as far as mechanical keyboards go. To be clear, though, the spill resistant keyboard is just that: spill resistant. The K68 doesn’t promise to be waterproof; you can’t submerge it and expect it not to glitch out. Rather it’s meant to survive a limited, accidental soaking – namely spilling your drink on your keyboard – something that doesn’t happen too often, but can be fatal to keyboards when it does. 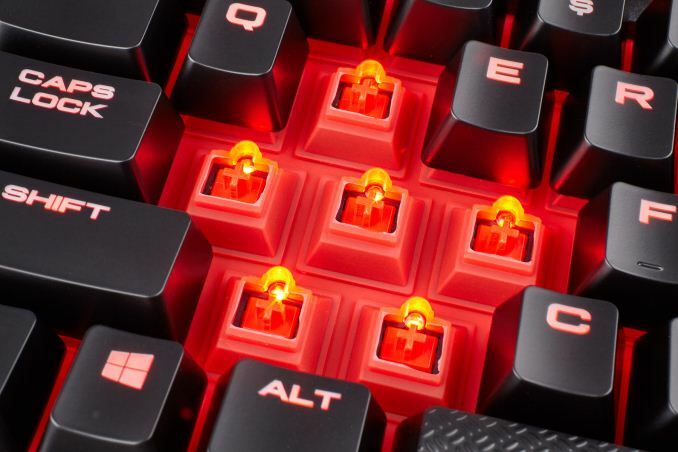 Overall the keyboard is rated for IP32 protection, according to Corsair. Officially the company is advertising the keyboard as both spill and dust resistant; on the former water level 2 is pretty typical for spill resistant devices, while dust level 3 is perhaps a bit more debatable. Dust level 3 means it is protected against objects larger than 2.5mm, which is actually quite large by dust standards. Practically speaking, it might be better to call the K68 crumb resistant, as dust will still be able to make it in tight spaces over time. Under the hood, the keyboard’s ingress protection is accomplished via rubber gaskets that surround the switch housings. Those gaskets are in turn protecting a full set of Cherry MX Red switches, giving this keyboard its mechanical pedigree. 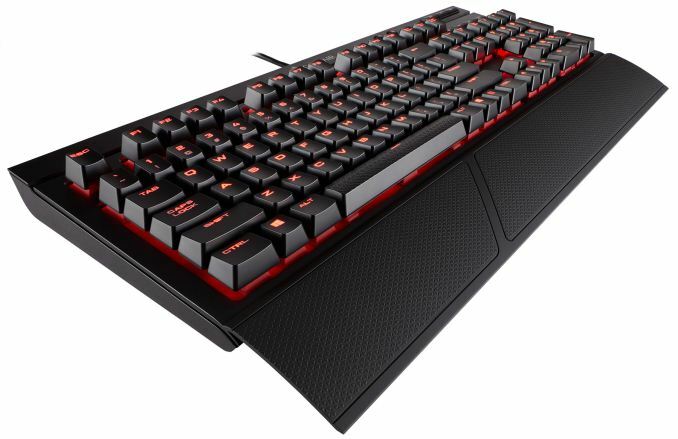 And, like virtually all high-end keyboards these days, this one also includes LED lighting, with red lights to complement the Red switches. Otherwise the K68 is typical for a high-end Corsair keyboard, supporting N-key rollover as well as the company’s CUE software. Finally, this week’s announcement of the Corsair K68 is also a hard launch for the keyboard. The company has priced the keyboard at $100 and has already started selling it. Splash resistance aside, this puts it smack-dab in between the company’s K63 and K70 keyboards in both price and functionality.